Sorry it's been so long since my last post. I've got something a little different and special this time. I whipped this up one night just to see if it would all come together, and surprisingly it did! I added some ingredients to my sauce that I know wasn't in the sauce at Red River - like Garlic. But hey - it's garlic. It makes EVERYTHING better! My husband's remark... "It's GOURMET hot!" Love. It. Chop the chipotle very finely. Stir into honey - this will thin it out a bit. Over low heat, combine honey mixture with the remaining ingredients. Heat until combined and runs thin. 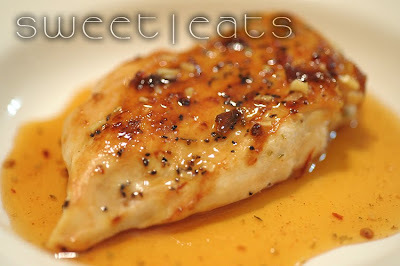 Salt and Pepper (to taste) Boneless, Skinless Chicken Breast and cook until juices run clear. 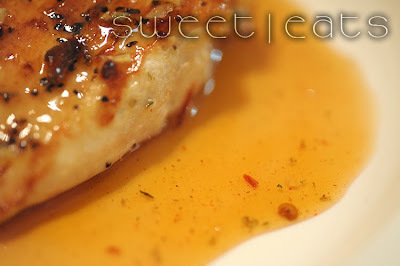 Pour glaze over fully cooked chicken. 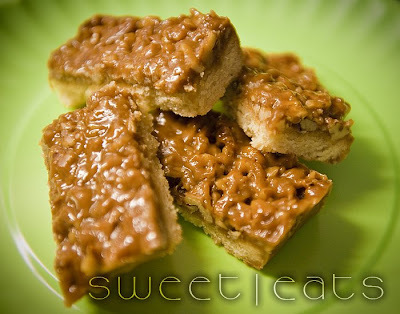 I made the addicting, wonderful, delicious Pecan Caramel Bar Cookies the other day... and I thought - caramel, add coconut - add chocolate - we've got Samoa bars! I used the same recipe (post below), just a variation of ingredients. The picture doesn't include the chocolate drizzle - but they are good both ways! Original full batch recipe at Epicurious. This recipe modified. Line a 9x13 inch metal pan with foil (I used Reynolds Release foil) and spray foil with cooking spray. Stir flour, baking powder, and salt together in a small bowl. Cream butter and sugar in a large bowl. Beat in egg and vanilla, then add flour mixture and mix until just combined. Press dough into bottom of pan and chill for about 20 minutes. Meanwhile, preheat the oven to 375 degrees F. When dough is chilled, bake it for about 15-20 minutes or until edges are golden. Let it cool on a rack while you make the pecan topping. Cook sugar in a 2- to 3-quart heavy saucepan over moderate heat, undisturbed, until it begins to melt. Continue to cook, stirring occasionally with a fork, until sugar is melted to a deep golden caramel. Tilt pan and carefully pour in cream (caramel will harden and steam vigorously - be careful!). Cook over moderately low heat, stirring, until caramel is dissolved - this will take a while, keep mashing and stirring that caramel until cream is incorporated. Remove from heat and stir in butter, vanilla, salt, and coconut. Quickly spread topping over cooled crust and bake until bubbling, about 15-20 minutes. Cool completely in pan on rack. Grasp foil, lift bars from pan and cut into triangles or squares. 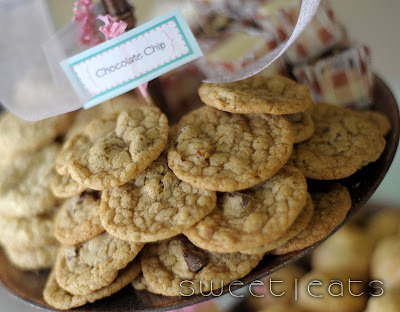 Drizzle each piece with a little melted chocolate or enjoy as is! 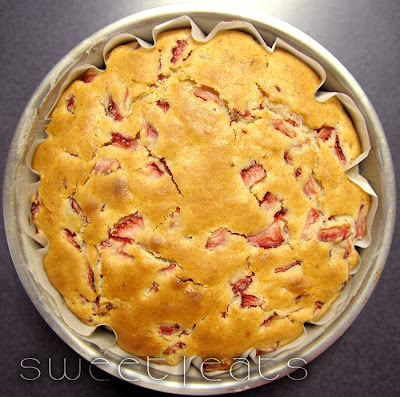 A few days after I made the delicious strawberry cake (see post below) - I had quite a bit of heavy cream left over. 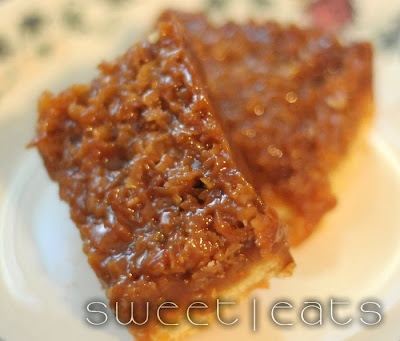 I found this recipe at Cookie Madness which called for making your own caramel! YIKES! I had never done that before, but I was up for the challenge! I watched my sugar like a hawk, which I'm sure made it take longer - and it did seem like it took forever for the sugar to start melting... and even longer to incorporate the heavy cream... BUT - let me tell you - it came out perfect the first time, and even more importantly, it was SO worth it! Talk about addicting. Pecans. Caramel. All on top of a tender, buttery crust. What more could a girl want!? Original full batch recipe at Epicurious. This recipe, slightly modified. Cook sugar in a 2- to 3-quart heavy saucepan over moderate heat, undisturbed, until it begins to melt. Continue to cook, stirring occasionally with a fork, until sugar is melted to a deep golden caramel. Tilt pan and carefully pour in cream (caramel will harden and steam vigorously - be careful!). Cook over moderately low heat, stirring, until caramel is dissolved - this will take a while, keep mashing and stirring that caramel until cream is incorporated. Remove from heat and stir in butter, vanilla, salt, and pecans. Quickly spread topping over cooled crust and bake until bubbling, about 15-20 minutes. Cool completely in pan on rack. Grasp foil, lift bars from pan and cut into triangles or squares. Enjoy! I bought some fabulous (& huge!) strawberries from our local produce market the other day. Then I realized I had to use them up before they ruined, so I looked up a recipe which included fresh strawberries. Over at The Hungry Mouse I found a wonderful recipe! This cake turned out very moist and delicious! It turns out a bit more dense than a normal cake, but not "too" dense. My family ate it with whipped cream and with the cake warm or cold, it's delightful! 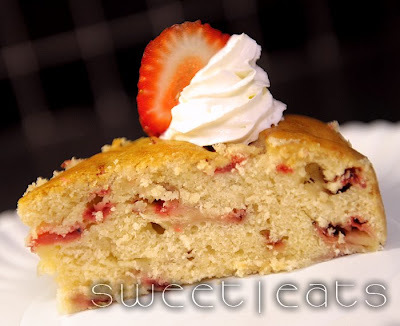 The chunks of strawberry make it tasty and beautiful at the same time. I think I'm going to make it using frozen blackberries next - YUM! I honestly think any berry would work perfectly in this cake. Preheat your oven to 375 degrees. Generously butter the bottom and sides of a 10-inch round cake pan. Cut a round of parchment paper and fit it inside your buttered pan. It doesn't have to be a perfect circle. If it creeps up the edges a little, that’s just fine. Set the pan aside. Cream together butter and sugar. Add the egg and mix well. When the mixture is fairly uniform, mix in the cream. Beat to combine. Add the flour, baking powder, and salt. Beat on high to combine. Beat until the batter just comes together. If you overdo it, the cake won’t be as tender. The batter will be really thick, almost like a soft cookie dough. When your batter is mixed, fold in the strawberries gently by hand, with a rubber spatula or wooden spoon. Set the cake pan on a rack and cool it right in the pan. To serve, slice into wedges or squares. We ate some warm out of the oven, and some cool, even from the fridge, and the cake is great in every way. You can serve as is, or top with whipped cream, vanilla ice cream, or fresh, sliced strawberries. Check out The Hungry Mouse for more great recipes! 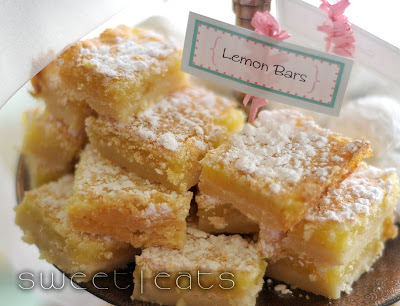 These are surprisingly simple to make and delicious! Thanks to Susan at work for this recipe which has been in her family for many years! Not sure of it's origins, but they are are huge hit whenever they are made! I made these for my daughter's birthday tea party, and it was nice to have a recipe for a 9x13 instead of the usual 8x8 to feed more guests. BASE: Mix and blend w/ pastry blender - pat lightly with finger into a 9x13 glass pan. Bake at 325º for 25 minutes. Pour on top of crust - return to oven - bake at 325º for 30 mins. Sprinkle powdered sugar on top when cool. Cut into squares. Stir together flour, baking soda, and salt; set aside. Beat together butter and sugars in a large bowl with an electric mixer at high speed for 2-3 minutes. The mixture will become pale and a bit lighter. Beat 1 egg with a fork in a small bowl and add a little less than 1 tablespoon of it plus the 1 remaining whole egg to butter mixture, beating with mixer until creamy, about 1 minute. Beat in vanilla. By hand, stir in flour mixture until just blended, then stir in chips. At this point, chill the dough for a few hours or overnight. For thinner cookies, you may skip the chill time. Scoop about 1/4 cup batter for each cookie, arranging mounds 3 inches apart, on 2 baking sheets. Flatten mounds into 3-inch rounds using moistened palm of your hand. Form remaining cookies on additional sheets of parchment. (I don’t always flatten the mounds). Note: I take the cookies out when the cookies are brown around the edges and look underdone in the center. They will cook internally as they cool. If you find the edges are cooking way too fast, try baking the cookies at 350 degrees instead. ** Super secret side note for making EXTRA tasty cookies: Make dough and refrigerate for at LEAST 24 hours, up to 36 hours. The flavors enhance and are wonderful! I started a food blog here as a place to post good recipes of anything and everything. Come by, try a recipe and enjoy! Comments are always welcome.